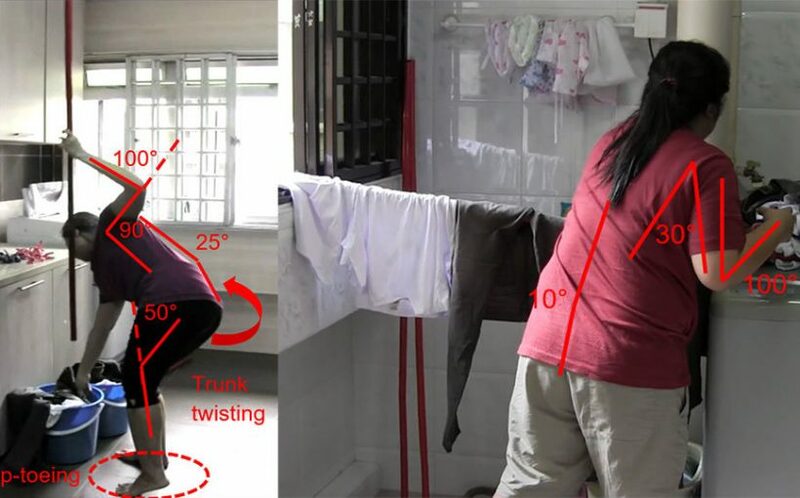 Drying laundry on bamboo poles in confined spaces puts Singaporean homemakers – housewives and househusbands – at increased risk of musculoskeletal disorders, the first-ever biomechanical study of laundry-related housework has revealed. 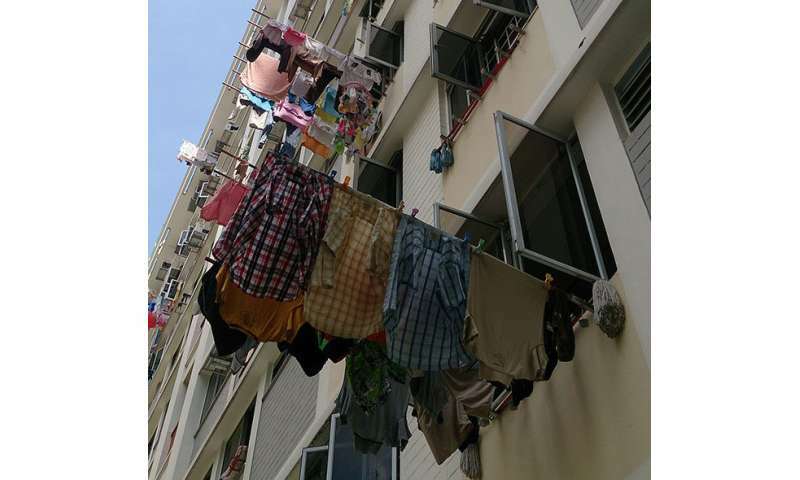 Singapore’s pipe–socket system involves attaching washed clothes onto a series of bamboo poles, which are then slotted into sockets outside kitchen windows, much like flagpoles. One of two main systems (the other involving two plates supporting both ends of the laundry pole), the pipe–socket system is provided in the older public housing estates, which house the majority of the country’s population. This unique system enables laundry drying in the humid city where open space is at a premium and tumble dryers are scarce. But with homemakers – those responsible for compulsory household maintenance work – comprising 2 in 10 of those presenting upper-limb musculoskeletal disorders at Singapore’s hospitals, occupational therapists set out to investigate why drying laundry can cause such pain. 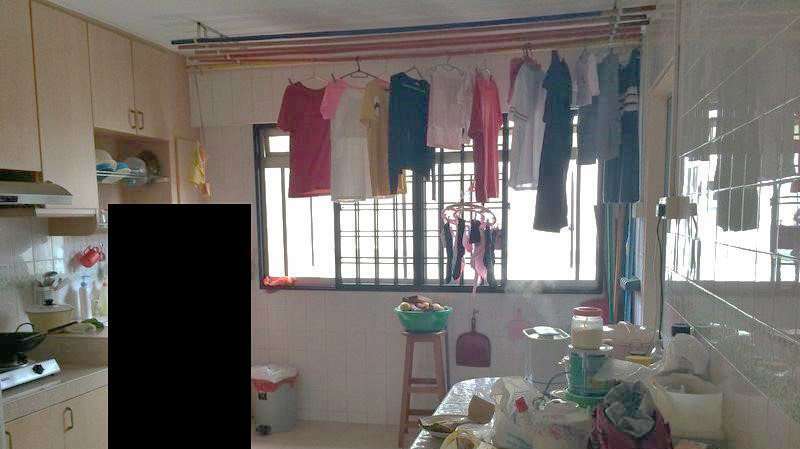 Five homemakers drying a standardised basket of laundry in their own homes were videoed by a team led by Lee Hong Rui, Principal Occupational Therapist at Singapore General Hospital, and who completed the study as part of her MSc in Occupational Therapy at Brunel University London in the UK. The researchers used the Rapid Entire Body Assessment (REBA) method to analyse each of nine distinct tasks in laundry drying and assess the risk posed to each homemakers. The most taxing tasks involved retrieving bamboo poles from the typically high overhead racks at the beginning of the process, and returning the poles at the end, presenting high musculoskeletal risk. Overall, laundry drying posed a medium risk to participants, with an average REBA score of 4.3 to 5.4 – significantly higher than the safe value of 2. Repetitive motions in extreme positions can cause a reduction in how well muscles perform – their functional capacity. Homemakers can compensate using coping strategies, but these often result in poorer posture, such as increased trunk twisting or shoulder elevation. Over time, this can result in conditions such as carpal tunnel syndrome, rotator cuff tendonitis and tension neck syndrome. adopting work–rest strategies to avoid muscle fatigue, given that the highest average REBA score was seen when working with bamboo pole number three out of six. “This is the first quantitative study, with concrete evidence on the positive association between the physical work environment of homemakers in Singapore and their musculoskeletal risk exposure,” added Ms Lee.